[ABOVE] Men's basketball at UConn began in 1901 with a single game played by Connecticut Agricultural College against Windham High School in January of that year. 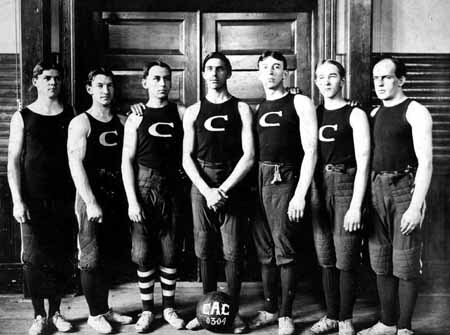 The college team won, and by 1903, basketball was a varsity sport. Players on the 1903 team (left to right) were: John Snow; Perry Cornwall; Dwight Shurtleff; George Chapman (captain and manager); Stephen Crowell; Ralph Tryon; and Fred Koenig. 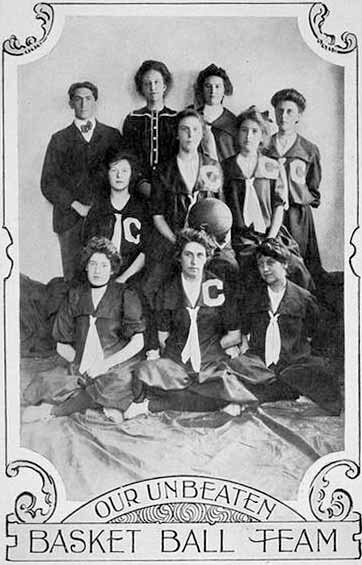 [ABOVE] Women's basketball began about one year after the men started playing on the campus. The first women's team, pictured here, played two games for their "unbeaten" season: both were wins against the Windham High girls' team. This photograph appeared in the CAC annual report of 1903.